Inshore, shepherd's house, view from the ENE. Inshore, shepherd's house, view from the south-west. Inshore, shepherd's cottage/barn, view from south-west. Inshore, shepherd's cottage/barn and house, view from the south-east. 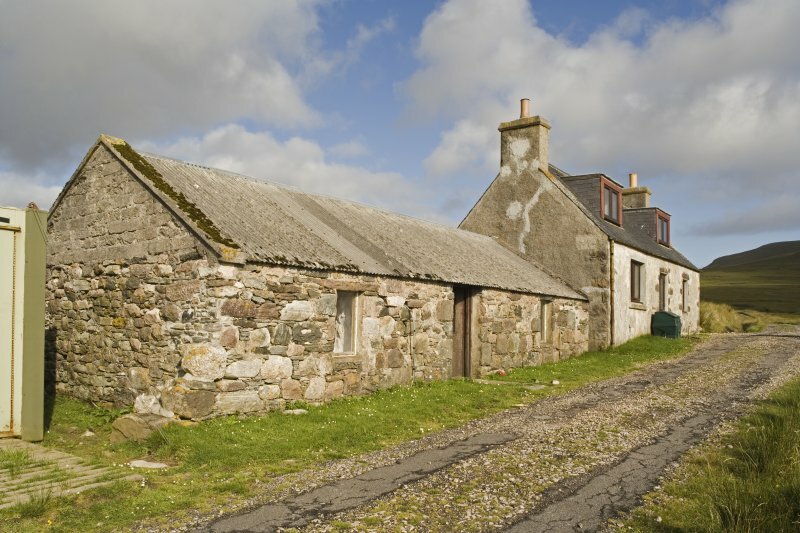 Inshore, shepherd's cottage/barn, view from the north-east. Inshore, shepherd's house, view from the west-north-west. Inshore, shepherd's house, view from the north. Inshore, shepherd's cottage/barn, view from the south-east. Inshore. 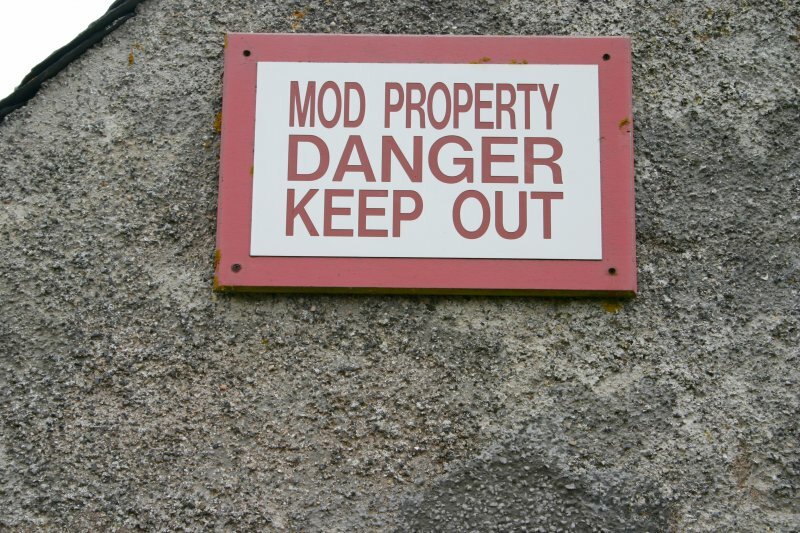 Warning sign on NNW gable of house. Inshore old house/barn, detail of window in E side. Inshore, shepherd's cottage/barn, view from E of SSE end of barn. View of cruck-beam in the ESE wall of the cottage at Inshore. 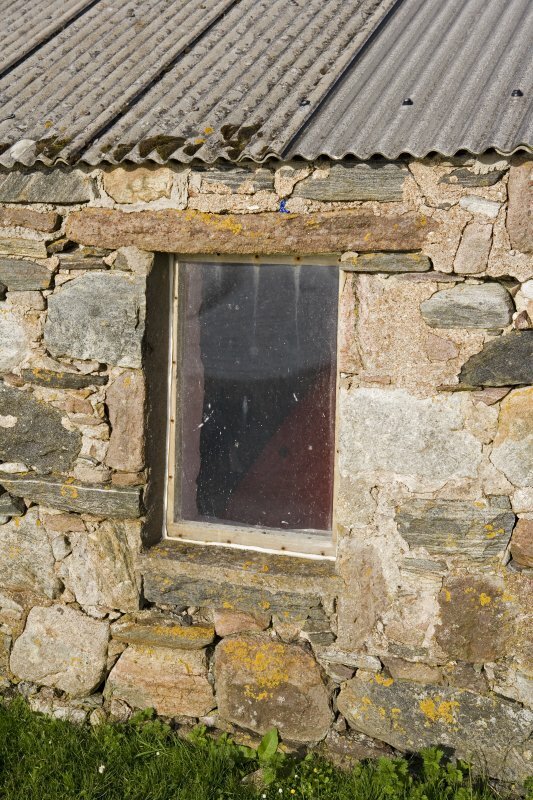 Inshore, shepherd's cottage/barn, view of blocked window in WSW side. Inshore, shepherd's house, view from the east. Inshore, shepherd's cottage/barn, view from NW. Inshore, shepherd's house, view from the south-east. NC 3262 6946. 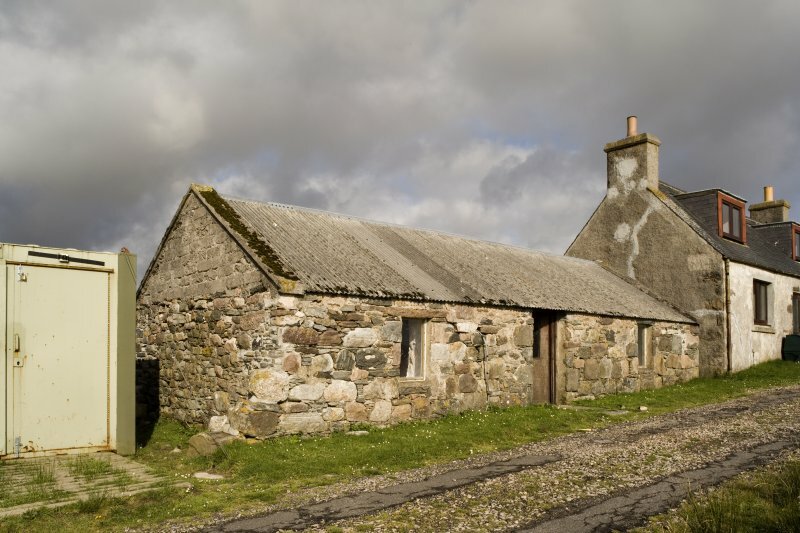 Inshore (OS 6" 1961) - a 20th century shepherd's house, adjacent to an earlier, still roofed stone and mortar house. Visited by OS 9 May 1980. At Inshore, there are 2 buildings and the stone remains of a 3rd structure. 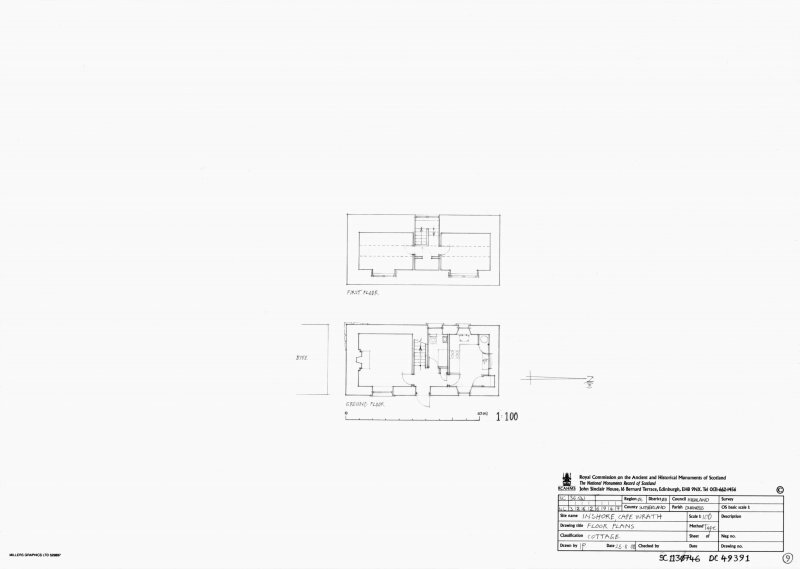 The building at the northern end consists of a ground floor and an attic with two prominent attic windows and two chimneys at each north/south pole (figure 3). The building is currently boarded up and in good condition with the eastern face lower windows and door filled with concrete blocks. 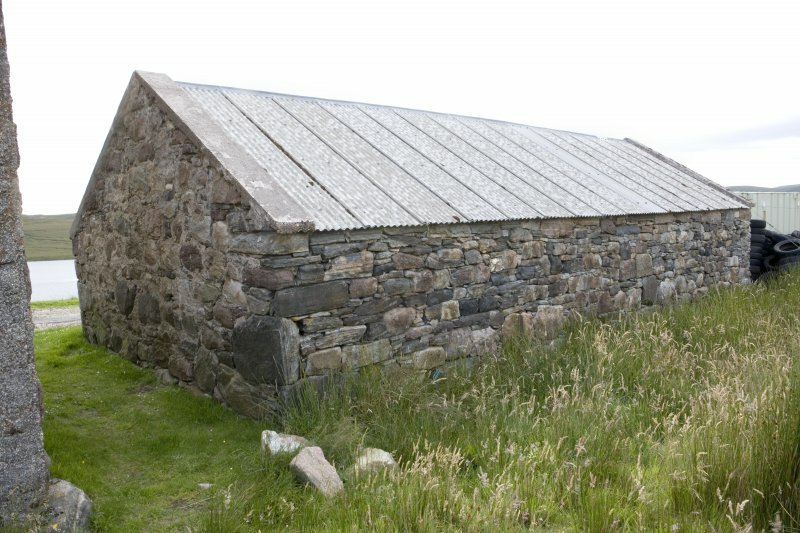 Adjacent to this building is a lower structure built of stone and mortar with a roof on congregated iron (figure 4). Attached to the southern side of this are the stone remains of a 3rd building (figure 5). This building measures about 7.5m by 6m with the surviving walls measuring to a height of about 0.3m. 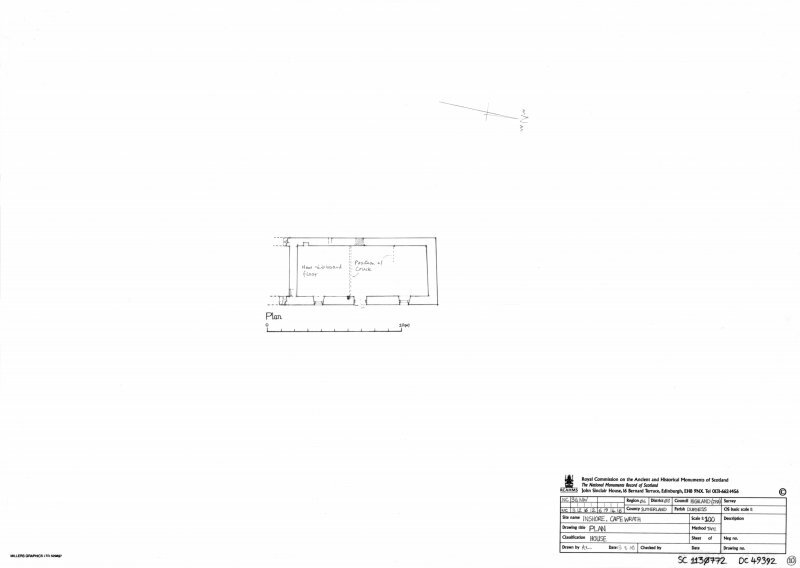 The two remaining buildings have not altered since the inspection by Ann Lieu last year. 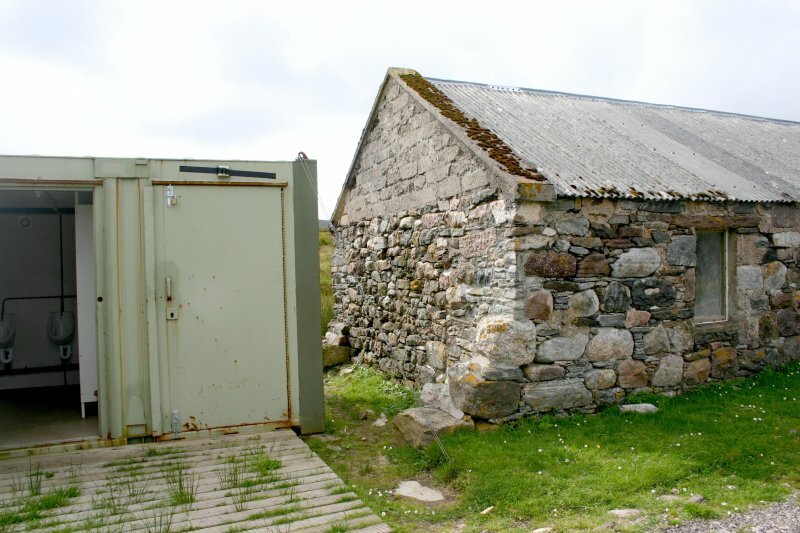 There was evidence of slight vandalism to the door of the Inshore but structurally the buildings remain intact. 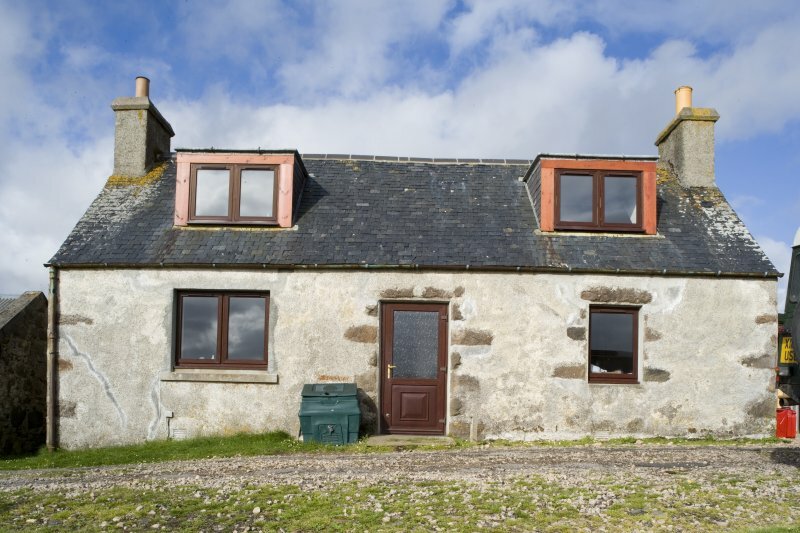 Inshore Cottage - The cottages survive as three distinct structures. The structure in the foreground of the picture survives as a series of foundations but is clearly visible in the immediate vegetation. The two remaining standing structures are intact and are in fair condition, the middle building is accessible and is used as a store and small shelter. The end building is secured with brickwork and boards and as such is inaccessible, it too stands in a fair condition. There is no physical change to the buildings condition as reported in the 2000 archaeological report. 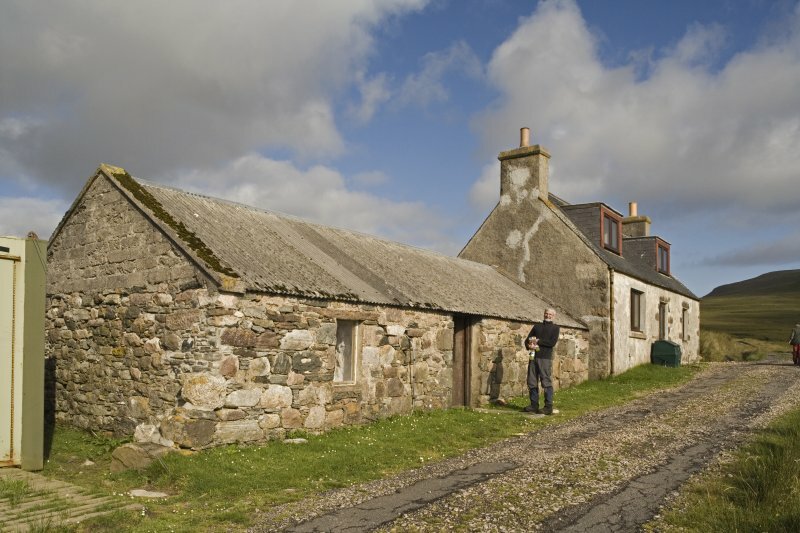 At Inshore, standing immediately W of and fronting the public road that leads to and from the Cape Wrath lighthouse (NC27SE 3.00), there is a former shepherd’s cottage (CWTC08 11), which was built in the early 1830s, and, directly N of it, a house (CWTC08 12) which was built around the end of the 19th century to replace it. 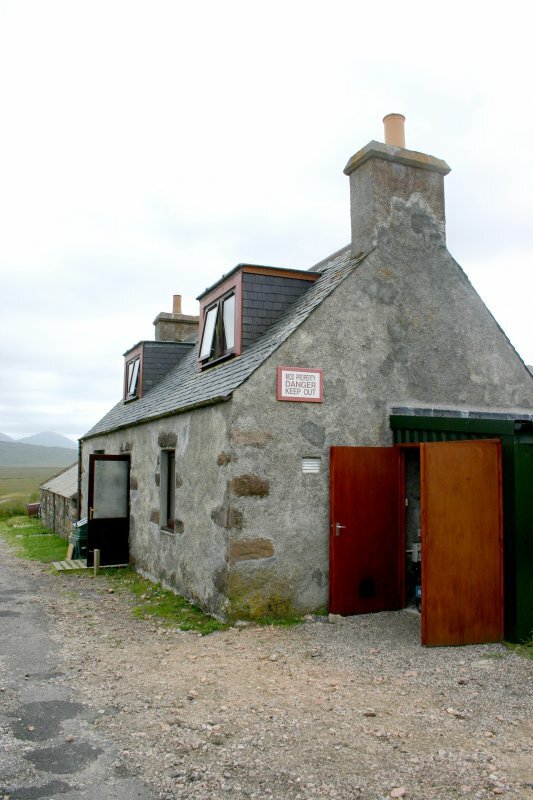 The house is currently used by the military as accommodation during exercises and is made available to non-military personnel at other times; the cottage is used as a store by the Cape Wrath Training Centre range wardens. 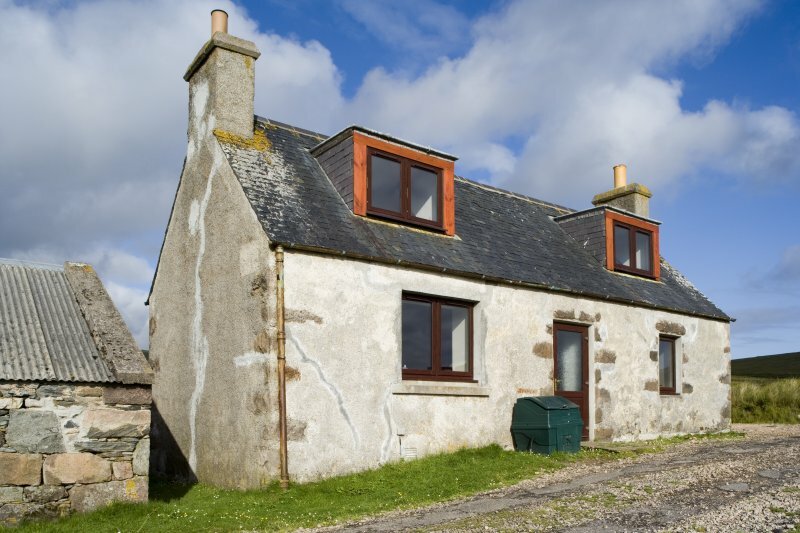 The cottage, which has been re-roofed and renovated in recent times, measures 10.9m from NNW to SSE by 5m transversely over mortared random rubble walls up to 0.7m in thickness at the gables. There is a central doorway with flanking windows in the ENE side and a small blocked window in the centre of the WSW side, indicating that the interior originally contained two principal rooms, with a third, smaller, one between them at the rear. The height of the gables (the SSE one has been rebuilt in breeze-block) suggests that originally there could only have been a small attic or roof space. In the interior, situated immediately S of the doorway, there is a cruck beam that rises in a wall-slot from floor level to the wall-head, where it and a crudely-shaped rafter which abuts the N side of the cruck beam, have been sawn through. 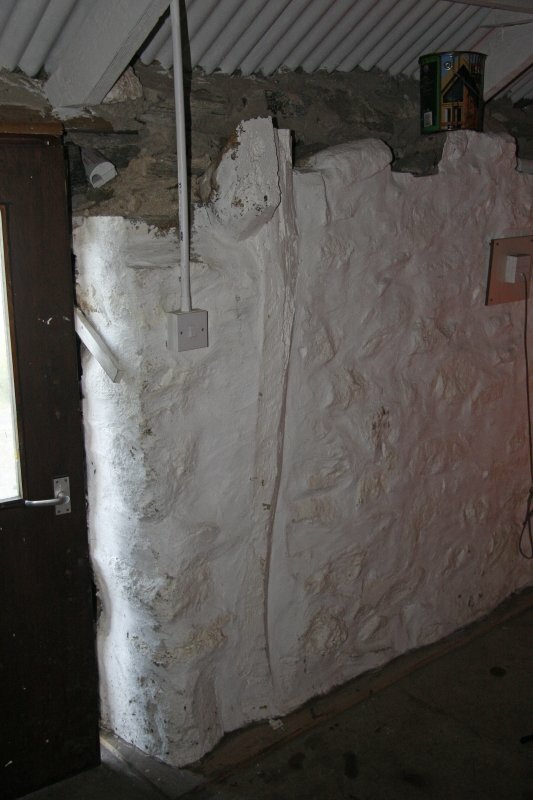 No other cruck beams or slots are visible in the heavily rendered and whitewashed internal wall-faces. In the rear wall, close to the SW corner, there is a small square ambry-like opening, and what is probably a drain, situated about midway between the SW corner and the blocked window, is visible only from outside the cottage. 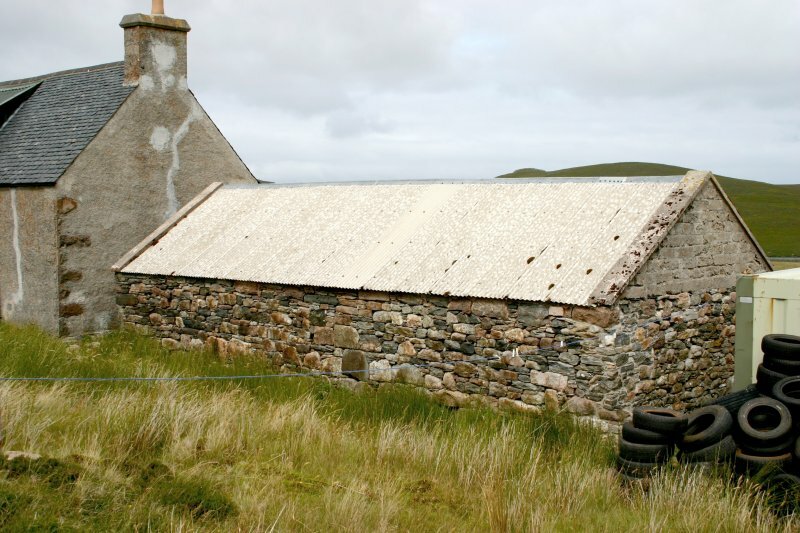 What appears to be a press with a timber lintel, which has been infilled, is visible at the E end of the external face of the SSE gable. 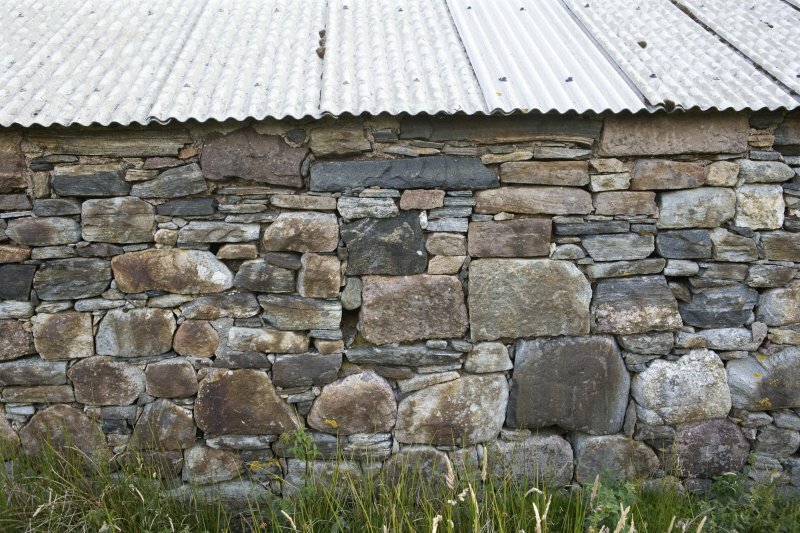 The press was an internal feature of the adjoining byre/barn, the surviving walls of which were levelled in 2005 to provide an area of level hard standing for a large portable toilet and shower block. 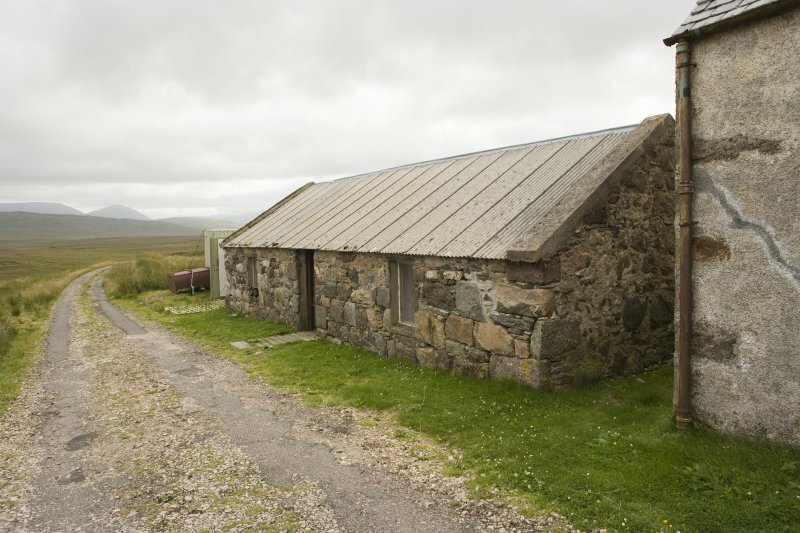 A vertical aerial photograph taken by the RAF in October 1946 (CPE/SCOT/UK185, 1138) shows that this byre/barn, which was unroofed at that time, measured about the same length as the adjoining cottage and contained two compartments. A photograph taken in July 2000 (Lieu 2000, Figure 5) shows the walls standing then to a height of about 1m at the SW corner. 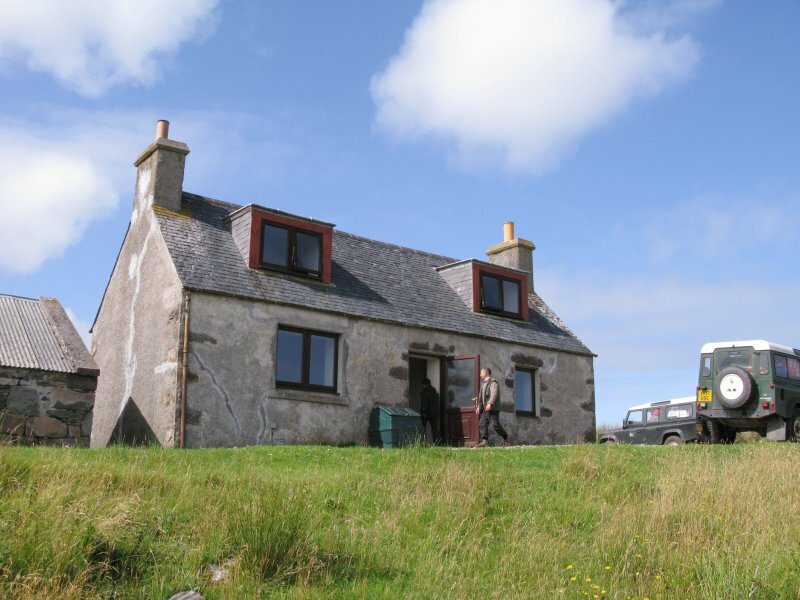 The house, which is of one-and-half storeys, measures 11.55m from NNW to SSE by 5.3m transversely over mortared stone walls with roughly shaped quoins and surrounds. 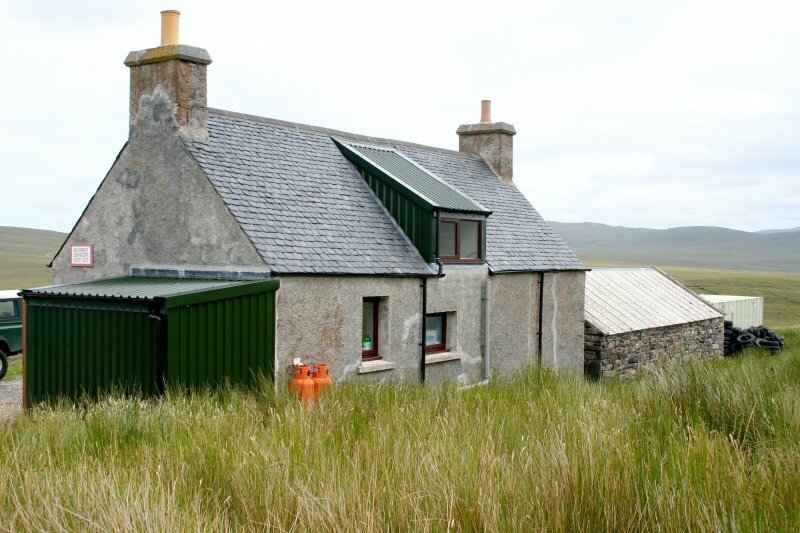 The external wall surfaces have been heavily rendered and there is a slate roof. The central entrance is on the ENE side and it is flanked by a window on both sides, the southerly one being a modern insertion. The entrance leads directly into a small lobby, which in turn leads into a kitchen to the right, a parlour to the left and, straight ahead, a toilet/shower room, which has probably been converted from a small bedroom, and a staircase to the first floor. In the kitchen the fireplace has been sealed and modern units installed, but original cupboards in the NW and NE corners have been retained. A window in the rear (WSW) wall is not an original feature. The parlour retains its open fireplace. The staircase is modern and at the half landing there is a wide and squat dormer window which provides both light and additional headroom on the stair. The staircase turns through 180 degrees to reach a landing which has a large cupboard on its ENE side and a bedroom at either end. Neither bedroom has a fireplace and both are fitted with a modern dormer window that has probably replaced a skylight. On the opposite side of the road from the house and the cottage there are the heavily overgrown stone footings of a large stock enclosure (CWTC08 436), which exhibits several phases of construction, but has been heavily robbed. 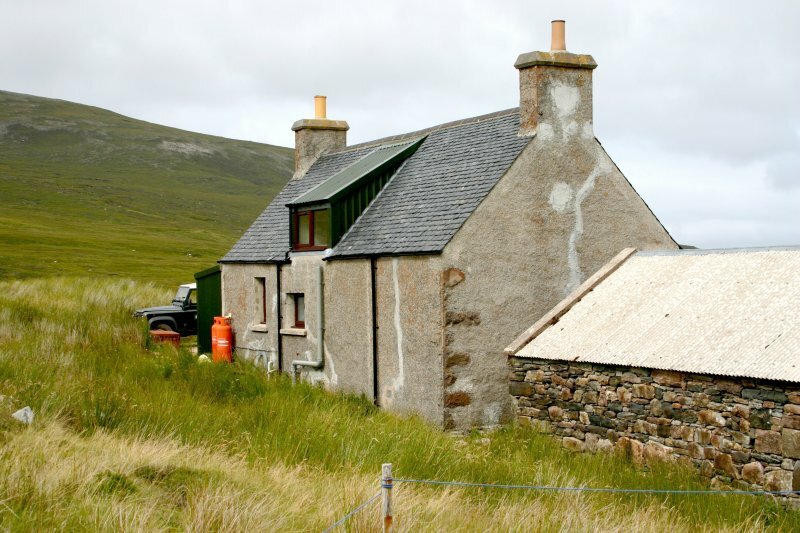 The cottage was described by the Ordnance Survey in 1874 as ‘one storey high thatched and in fair repair, on the property of his Grace the Duke of Sutherland’ (Name Book, No. 16, p.46). Visited by RCAHMS (JRS, JH) 10 August 2008. Field visit by Ordnance Survey (no name of staff member on field report).